In 1996 there were approximately 250,000 Tasmanian devils (Sarcophilus harrisii) in the wild, but by 2009 their numbers had crashed to less than 50,000 — some populations decreased by 90 per cent. 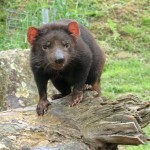 The cause: the infamous Devil Facial Tumour Disease (DFTD), a transmissible cancer that has now decimated 85 per cent of Tasmanian devils in the wild. It is estimated that over 100,000 animals have died from this unsightly disease and, despite all our hopes, it’s not showing any signs of slowing down. In fact, new research from the University of Sydney (USYD) suggests that this disease is able to survive indefinitely and could possibly get stronger in the future. These hopes weren’t completely unfounded, the disease has been out there among the devils for 16 years and has divided millions of times, according to USYD postdoctoral research fellow Beata Ujvari. The low genetic material allows the disease to spread between individuals — it’s one of only three cancers that can be spread this way — through mating, fighting and sharing communal carcasses. The tumour behaves like an organ transplant or a skin graft, and it’s recognised as being part of the devil, not a foreign body, so it’s not rejected. Scientists were hoping that the cell line of these tumours would eventually start deteriorating as it continues to divide and spread, but the disease is still replicating as fast as ever. “Previously we had hoped that the disease would slow down or would show signs of slowing down, but unfortunately our recent findings made us realise that the disease may never die out,” Ujvari says. In fact the results from the study conducted by Ujvari and her colleagues and published in Plos One suggest that DFTD represents one of the oldest naturally living and continuously transferred cell lines in nature. Research conducted earlier this year by scientists from the Menzies Institute in Tasmania suggested that the disease arose in a single female devil. No one knows how it all began, but one of her chromosomes may have been scrambled through exposure to a carcinogenic chemical or a virus. But while she is now dead, her genes still continue to live on in the genome of the disease over 16 years later. One of the keys to this immortality lies in the telomeres, the molecules that keep chromosomes from sticking together during cell division and protect them from fraying — they have been compared to the caps on the ends of our shoelaces. In normal somatic cells, such as bones and connective tissue, the telomeres shorten with every cell division. The cells are eventually unable to divide once they reach a critically short telomere length, and die. But this isn’t the case with DFTD. The researchers examined telomere changes in DFTD cells and found that an enzyme called telomerase is activated and helps to replenish the diminishing telomeres. So instead of dying, these cancer cells can divide and proliferate without limits. This mechanism had already been observed in human cancer cells, so it didn’t come as a complete shock. But the disease had another nasty surprise in store for the researchers. “We found that both the length of telomeres and the activity of the enzyme telomerase have been increasing over time, providing the DFTD cancer cells with unusual stability, leading us to the conclusions that DFTD cells are immortal,” Ujvari explains. Additional research will be required to determine whether this increased telomerase activity can affect the cell division rate and whether this is increasing in the devils. In the meantime, since the tumours aren’t going to die out, it looks like the best approaches for saving this species from extinction are either removing them from the path of the disease through captive breeding programs or by developing a vaccine. “Since vaccine development might take some time, the urgent task at the moment is maintaining a healthy and genetically diverse population in captivity,” Ujvari concludes. Her research group is in the process of sequencing the genomes of every devil kept in captivity in an effort to determine the genetic diversity of the devils and to aid the captive breeding program in every way possible. Another possibility is a complete lifestyle change — devils aren’t exactly social animals and on the rare occasions when they do get together, they tend to bite. Scientists from the University of Tasmania recently found that the aggressive devils who bite others, rather than being bitten themselves, are more likely to get the disease as they bite on the tumours; and most of the lesions and lumps were found on the inside of their mouths. But for this solution to work, they need to develop a better understanding of devil behaviour — what makes some shy and others aggressive. Let’s hope the devil can last for a while longer in this race against time.